Merging is the process of combining two or more adjacent cells with the same data into a single cell. The merge cells can be enabled in the GridGroupingControl by setting the MergeCell, MergeCellsMode and MergeCellsLayout properties. The calculating behavior of the merge cells can be set by using the MergeCellsMode property. It is used to set whether the merge cells need to be calculated at the time of loading grid or calculate on demand basis. 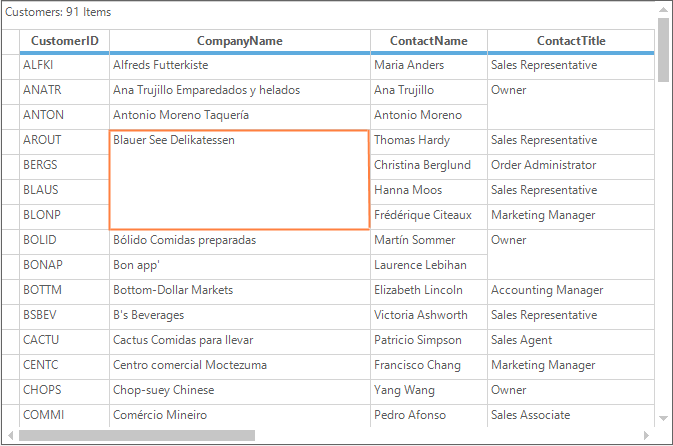 It can also be used to set the behavior of the merging such as rows in columns, columns in rows and hidden range of cells using the GridMergeCellsMode enumeration. 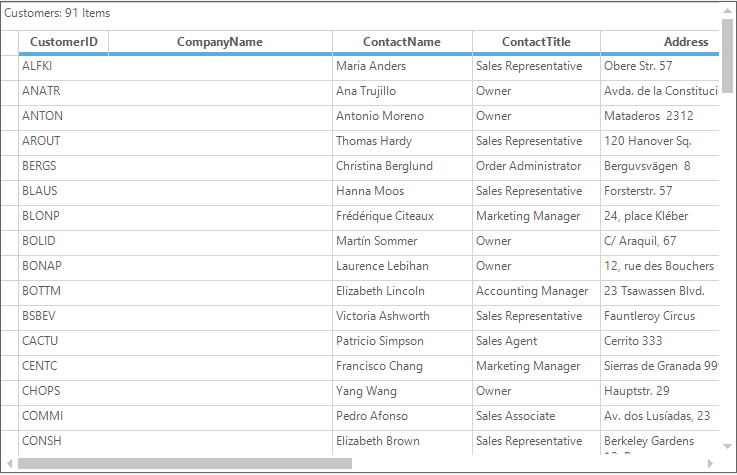 The adjacent rows with the same data can be merged into the single column by using the MergeRowsInColumns option. 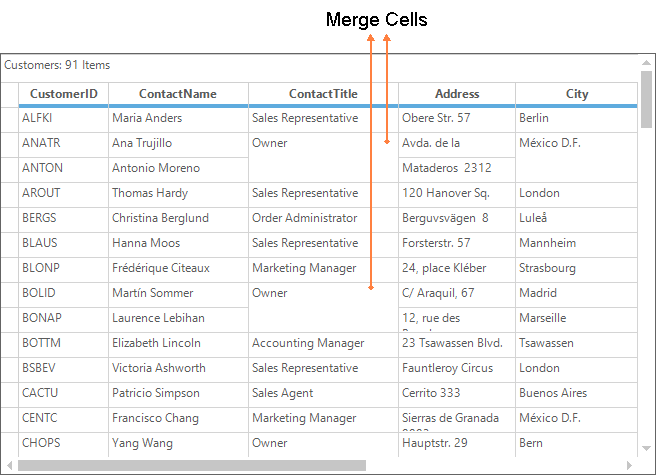 The adjacent columns with the same data can be merged into the single row by setting the MergeColumnsInRows option to the MergeCellsMode. The hidden rows and columns can be ignored when comparing the values and merge across them by using the SkipHiddencells option. 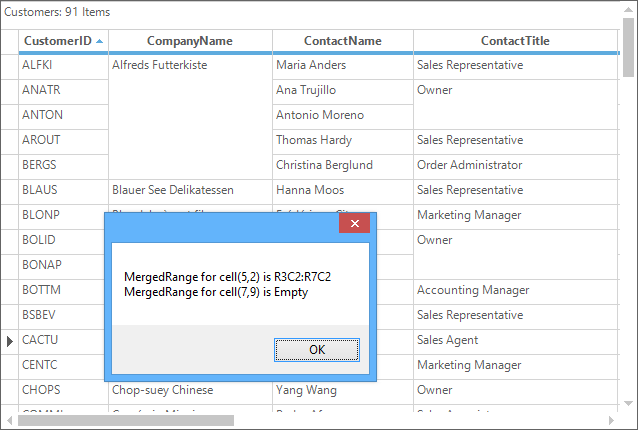 Merging can be applied to the cells dynamically based on the cell values. The merged state will be preserved after any dynamic change such as sorting or grouping. By default, when merging is applied in the cells, the grid’s bounds will be drawn with respect to the MergeCellsMode applied in the grid. In the case of GridGroupingControl, when the grid’s view layout is changed, the merged state becomes invalid and the grid still have its initial state of bounds. //Existing code to set merge cells. //Sets the range of cells. 'Existing code to set merge cells. 'Sets the range of cells. The merging can be delayed for specified range of cells by using DelayMergeCells methods. The delayed merged cells can be re-evaluated later by usingEvaluateMergeCells methods. Therefore the merged cells which are delayed will not be re-evaluated until EvaluateMergeCells method is called for that specified range. The MergeCells collection maintains all the merged ranges of a GridGroupingControl. To find a merged range of a cell, FindRange method can be used. 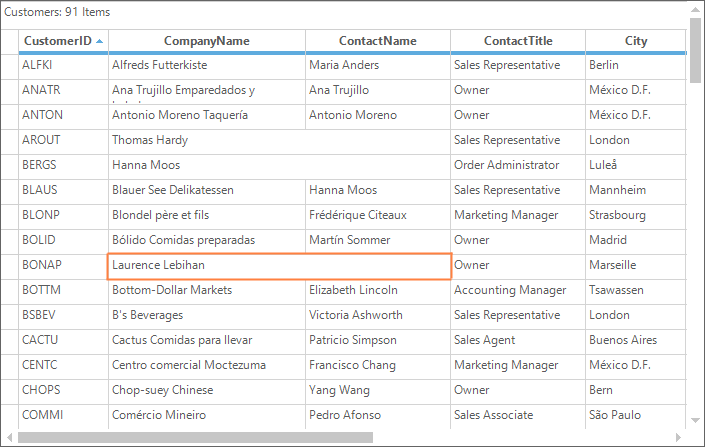 If the specified cell with row index and column index is inside a ` MergedRange `, a range will be returned. Otherwise it will return the empty range. The merged range of a cell can also be get by using GetSpannedRangeInfo method. The cell merging can be customized by handling the QueryCanMergeCells event. This event will be raised when grid compares the content of the two cells to determine if they should be merged. It can merge the cells when the e.Result and e.Handled is set to true.